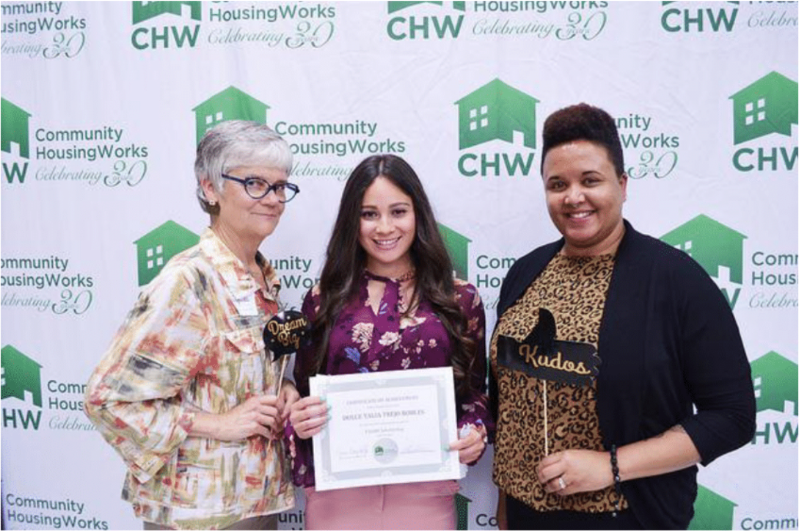 SAN DIEGO (June 12, 2018)---Community HousingWorks (CHW), a nationally-recognized non-profit that builds, rehabilitates, and operates affordable apartment homes, awarded $33,000 in scholarships to 35 residents as part of a program supporting post-high school educational opportunities. The awards are part of CHW’s VALOR Scholarship program which supports residents of CHW communities who have demonstrated academic success and community leadership. More than 150 attendees celebrated this year’s VALOR Scholarship recipients at the ceremony on Saturday, June 9th at the Poway Community Auditorium. Kaiser Permanente, US Bank, individual CHW donors and other corporate sponsors contributed funds for the scholarships. "We are proud to celebrate the achievements of this year’s VALOR Scholars, who are all taking important steps forward in their educational journeys,? said Sue Reynolds, President and CEO of Community HousingWorks. ?These exceptional people are not only demonstrated leaders in their communities, but are actively building a better future for themselves and their families." Since the VALOR Scholarship Program launched in 2007, CHW has awarded more than $130,000 in scholarships to more than 100 high-achieving residents in San Diego and Los Angeles counties. In celebration of the organization’s 30th Anniversary, the 2018 ceremony awarded more scholarships than in any previous year. This year’s VALOR Scholars come from 19 of CHW’s 38 communities throughout California. The scholarships will be applied to education at community colleges, four-year universities, and professional and technical certification programs across the country in subject areas as diverse as Biochemistry, Political Science and Cosmetology. "?The VALOR Scholarship will not only help me to achieve my goal of becoming a registered nurse, it will help me to serve others,? says 2018 VALOR Scholar and keynote speaker, Dulce Robles, a single mother living in a CHW community who is the first person in her family to attend and graduate from college. ?My ultimate goal is to help as many people as I can. I want to use my skills to serve those in a hospital setting, and give back to my community. Just as I have been supported by CHW, I would like to assist in changing people’s lives." (Left to Right) CHW CEO Sue Reyonlds, VALOR Scholar Dulce Robles and NeighborWorks America Public Affairs and Communications Advisor Bridget Jackson pose for a photo at the June 9th ceremony. The celebration was part of NeighborWorks Week (June 3-10) during which CHW and other members of the national NeighborWorks Network mobilize to support neighborhood change and awareness. Community HousingWorks is one of more than 240 nonprofit organizations in the NeighborWorks Network which represents every state, the District of Columbia and Puerto Rico, and works to create opportunities for people to live in affordable homes, improve their lives and strengthen communities. HousingWorks Community HousingWorks (CHW) is a nationally-recognized non-profit organization that builds, rehabilitates, and owns stable affordable apartment homes and provides on-site services to help residents build stronger futures. CHW has 30 years of success developing new and renovating existing multi-family, affordable rental apartments inurban, suburban and rural communities. With more than 3,000 rental apartments in 38 communities statewide, CHW proudly serves more than 9,000 children and adults each year. CHW is an Exemplary-ranked member of the national NeighborWorks Network®, an award-winning affiliate of UnidosUS, and member of the prestigious Housing Partnership Network. Learn more at www.chworks.org.